Have we just zoomed in on the aluminium Nokia EOS? Taking some cues from the 925? The Nokia EOS is expected to bring its 41-megapixel sensor to fingers at its July 11 New York event, but for those of you who just can't wait the extra month, we've seen some more pictures that both entice and confuse in equal measure. These snaps, courtesy of mysterious Chinese sources, give us a few more angular views on the EOS over the images that dropped recently. However, even more interestingly suggest that Nokia may be going for an aluminium casing in the style of the Lumia 925. What we'd seen in leaks so far shows a polycarbonate design, but we can't be certain as to whether Nokia has settled on aluminium or if it's just a prototype. The photo-focused handset is expected to bring a 41MP camera like that found in the 808 Pureview, strongly hinted at in the Nokia invitation which is headlined "Zoom. Reinvented." It's also expected to land running Windows Phone. 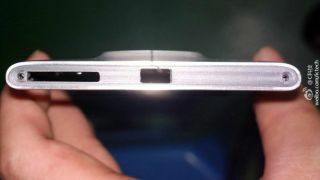 While the camera sticks out a little, the rest of the body looks on par with the Lumia 920's slim figure. Nokia has only just launched the Lumia 925 and Lumia 928, so it's good to see the Finnish company making good on its promise to bring out the big guns this year with a large range of offerings. TechRadar will be at the July 11 event in New York to bring you the news as soon as it breaks.